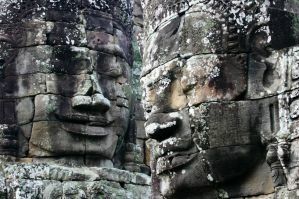 Siem Reap, Phnom Penh, and Sihanoukville are popular destinations on the well beaten Southeast Asian backpacker trail. Their popularity means that there is no shortage of amenities and activities for tourists, and these towns' nightlife will not disappoint. Although most visitors come to Cambodia to explore the famous Angkor Archaeological Park, the country itself has become its own type of destination. There are a wide variety of bars, restaurants, and cocktail lounges in all of these destinations where visitors can hang out until the late hours of the night after exploring all of the cultural and historical sites. For backpackers and budget travelers, Pub Street, in downtown Siem Reap is the place to go for cheap beers and happy hours. Sok San Road is also a popular destination. It's just across from Pub Street and it's lined with a large number of bars and restaurants. If you want to take advantage of Cambodia's nightlife and also want a cheap place to stay, you'll find a wide variety of guesthouses, hostels, and budget hotels. Prices are often negotiable, so if you're willing to be flexible, you can sometimes find a great deal. Like elsewhere in Southeast Asia, there are always new places opening and older places closing. It's a good idea to talk to other travelers on the road before you arrive. Often times guidebook recommendations become quickly dated so recent visitors usually offer the best references and recommendations. Also, once a hostel finds itself in a popular guidebook like Lonely Planet, they often raise their prices and let their quality slip. 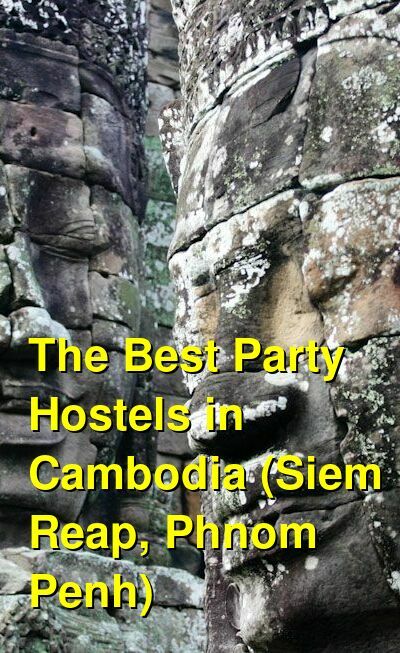 The hostels below are among the most popular party hostels in Cambodia. If you're in the area to party, then these places are where it's at. They have a strong reputation and fill up quickly, so advanced reservations are recommended. Eighty8 Backpackers hostel is an oasis within the heart of a bustling Phnom Penh with a swimming pool for a cooling dip. This is not only a fun social hostel, but also a great place to chill out, relax, meet fellow travelers or make new friends, and of course, party. They offer an all you can eat breakfast for a small fee. The property is pleasantly located away from the noisier parts of the city where you get a real insight to Cambodian city life and Khmer culture, with a local shops and a street market on their doorstep, along with many Khmer style restaurants and coffee shops in neighboring streets. The hostel is a short 3-minute walk from Wat Phnom the traditional center of the city and close to the Central, Old, and Night Markets which is the starting point of Phnom Penh's famous Riverside and Royal Palace area, making this hostel a great place to escape the bustle of the city while remaining near to great attractions and nightlife. All Eighty8 rooms come with AC, fan, and hot showers as standard and free high speed Wi-Fi is available throughout the hostel. They also offer both twin and double bed private rooms, all with en-suite bathrooms, and some rooms having balconies, room safes, wardrobes and daily water along with tea and coffee making facilities. The dormitory rooms come with big personal lockers and en-suite shared bathroom facilities and each bed has USB charger socket and reading light. A recent addition to the hostel are the new sleeping pods, a dormitory style room with private sleeping pods and lockers with shared private en-suite bathroom cubicles. All pods come with reading light, USB charger sockets, fans, and room AC. Eighty8 has a large common area with a big screen for sports and events along with a Restaurant and Bar serving both Khmer and western delights along with cold Cambodia beers and great cocktails. Linens, parking, and towels are also included with your stay. The Mad Monkey Hostel is one of the best party hostels in Siem Reap. It's located conveniently close to the temples of Angkor Wat and it's a large facility that sleeps more than 100 people. There is no shortage of entertainment here, and many guests enjoy hanging out on the rooftop "beach" bar. It's the perfect place to meet other backpackers who also enjoy the bar scene. The bar is open until late in the night and it has comfortable seating and hammocks available. The hostel hosts nightly events and parties. There are often free shots, fun music, and a good crowd. If you want to party hard, then this hostel is among the best. If you want to head out to Pub Street, it's just a five minutes walk away. The temples of Angkor Wat are seven kilometers away and tuk tuks are available through the hostel. The hostel offers Khmer style with western amenities. There's a coffee shop on the first floor and packed lunches are available for guests while they explore the temples. Although the prices are a bit more than some other hostels in the area, The Mad Monkey has a long time reputation as the place to stay for its party atmosphere. This is one of the most popular hostels in Siem Reap so advanced reservations are highly recommended. The rooms are in high demand so make arrangements well in advance. Funky Flash Packer is a self declared party hostel. The parties are loud and fun, and they last until the early morning hours. There are two on-site bars, live DJs, and music throughout the day and night. If you've come to Siem Reap to meet other travelers and have a good time, then this is the place to stay. The hostel is located about six minutes from Pub Street and just a couple minutes from Sok San Road. It has relatively large rooms that are surprisingly comfortable. Air conditioning is available for an additional fee. Guests are also provided with security boxes for their valuables. There's an shared kitchen available that guests can use to prepare their own meals, but there's also food available that is reasonably good and cheap. If you've come to Siem Reap to party, then this is one of the best places to stay. Don't expect to get much sleep, but you can be assured a fun and wild night. The hostel also takes advantage of the Siem Reap Pub Crawl, which is a great opportunity to explore the many bars and venues around town. Siem Reap Pub Hostel is located near night market, which is just a few minutes' walk to the Pub Street area. It is within close proximity of the north of Angkor Night Market. At Siem Reap Pub Hostel, you can meet friends from all over the world at the large common area, enjoy free internet and Wi-Fi access anywhere in the hostel, or relax in the cozy TV room and swimming pool. The friendly staff here will be more than happy to provide you with information about the city and tour arrangement. Siem Reap Pub Hostel also provides: free internet in common area and free Wi-Fi throughout the building, personal electronic socket, personal reading light and mirror for every bed, large locker with key for every guest, free swimming pool for every guest, large common area, spacious shared bathroom, separated by gender, with hot shower, ticket and tourist information office, free city maps, free parking, and linens and towels included. Top Banana Guesthouse on street 278 sits snugly in the heart of the city offering a safe and comfortable environment for guests. They offer great rates, tasty food, and a lively bar at one of the longest established backpackers guesthouse bar and restaurant. Top Banana has been operating for 17 years and has become one of the most popular places for travelers and expats alike. They offer free Wi-Fi that extends to the rooms and the rooftop restaurant and the on-site bar serves a range of Khmer and international dishes, as well as a vast drinks menu. The cool rooftop chill out area in the day becomes a bustling bar at night with some live music and other events to entertain guests. The dorm rooms have lockers and shared bathroom facilities along with a/c and large single beds. The private rooms available have en-suite bathroom and with a/c options. Guests have access to the next door neighbor's swimming pool, provided they use their bar / restaurant facilities. Airport/bus transfers and day trips can be arranged at the tour desk along with visa's for your onward trip. Top Banana is just a few minutes' walk away from Lucky Supermarket, Wat Lanka, Independence Monument and 10 minutes from Boeung Keng Kang Market, the Royal Palace, the National Museum, Wat Phnom and the Tuol Sleng Museum. Phnom Penh International Airport is around a 30-minute journey. Mad Monkey Phnom Penh is a socially responsible business located in the heart of the city. This is a great place to make friends and memories during your travels in Southeast Asia. If you're looking for cultural experiences, they offer a full range of local tours and can also help you with travel, tickets, and visas. If you want to relax, they have an awesome swimming pool and poolside bar. If you came to party, their Rooftop Bar never disappoints and they are also happy to show you the best night on the town Phnom Penh can offer. They offer a variety of rooms to choose from - dorms with oversized single mattresses, A/C, and individual bag lockers, to ensuite privates that are clean and comfortable with all of the necessary amenities. The restaurant serves delicious Asian and Western meals, prepared to international standards. Free city maps, Wi-Fi, linens, and towels are included. The Big Easy is a well-established backpacker hostel with dorms and rooms. All dorms are air conditioned, with hot water showers, individual power sockets, lockers, and privacy curtains. The Big Easy has one of the liveliest and most popular bars in the area, with alternative music, live sport, and music, and different events each night of the week, as well as being the starting point for the Original Sihanoukville Pub Crawl. The menu in The Big Easy is highly reviewed and rated, with a trip advisor certificate of excellence. Whether you like Tex-Mex, Asian, or British comfort food, you will be sure to find something to satisfy you. Free Wi-Fi and towels are included with your stay. Monkey Republic is located 100 meters from the Golden Lions traffic circle, right in the heart of Sihanoukville's lively backpacker area - Serenipity Beach Road, and only 200 meters to the beach and pier that services the islands Koh Rong and Koh Rong Samloem. At Monkey Republic, brick bungalows and rooms hold up to four people. Each room features a ceiling fan, western style en-suite bathroom, lock box for valuables, free Wi-Fi and 1-4 comfy beds. Air-conditioned rooms are also available. In addition to this, there are two 6 bed and two 4 bed Air-conditioned dorms, all with en suite bathrooms. Monkey Republic offers a diverse menu - everything from Western home comfort food to Asian favorites, at affordable prices and large portions. Daily specials keep things interesting and free Wi-Fi is available throughout the entire guesthouse. If it gets too hot, Monkey Republic has a swimming pool with large sun loungers and poolside music and bar. They also have an upstairs lounge bar with big screen TV's and online dart machines for those hangover days. You must be at least 18 years old to stay in the hostel. Free city maps, Wi-Fi, parking, linens, and towels are included.